At Precision Installations, Inc., we’ve built a solid reputation on installing after-market products on emergency vehicles. Our company began more than 20 years ago as the only emergency equipment installation company for Pierce Manufacturing fire trucks. Our relationship with Pierce and Oshkosh Truck continues to this day as a Tier 1 emergency vehicle outfitter for both the companies. Emergency vehicle intercom systems and lighting installed quickly to meet your needs. At Precision Installations, we know what it takes to ensure your firetruck, police car or ambulance is upfitted to meet the highest safety requirements. 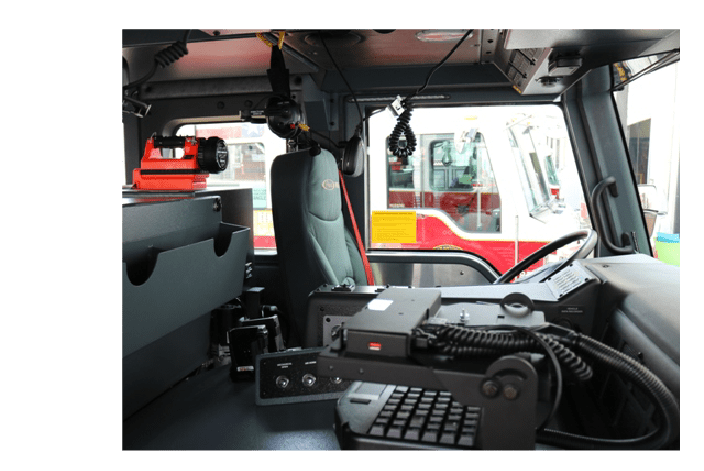 As a preferred emergency vehicle upfitter in the Midwest, we offer a wide variety of emergency vehicle intercom systems, lights and sirens to ensure you’re seen and heard. Whether it’s a brand-new emergency vehicle or an enhancement to an existing vehicle, we’ve got the talent and experience to get the job done quickly. Contact us today to get a quote at 920.380.1360. Experts in all aspects of emergency vehicle equipment installations. Our goal to help build a vehicle upfitted with all the equipment and safety features needed for you to do your job well. To make best use of your time, we also will outfit your vehicle with other after-market products like lights, MDT mounts, sirens as well as loose equipment, even firefighting hats and coats. We are your vehicle’s one stop between leaving the factory floor and being put to use on the road, quickly and efficiently. And, if you are looking to change over systems in an existing vehicle, our technicians have the experience of working with a variety of vehicles to ensure modifications are done right. Whether you need basic communications or intricate systems that work together, you can rest assured that you’ll have reliable communications, sound and lighting when you need it most. We ensure your system’s interface with each other and work compatibly with other remote systems so that you maintain communication connections during an emergency. If you are searching for emergency vehicle outfitters, contact us or give us a call at 920.380.1360. "I've had a relationship with Precision for nearly 20 years now. The team at Precision Installations is reliable and have proven expertise in emergency equipment installation! "